Update, as of 2016 – the FD Connect is now known as the Floppy Emulator from the Floppy Connect line. 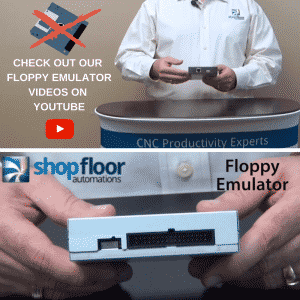 Shop Floor Automations has introduced its new FD Connect solution, which will eliminate floppy disk media and drives on the manufacturing floor. Floppy disks are easily damaged in the shop environment due to dirt, oil and grime and are becoming impossible to replace. The FD Connect solution eliminates the need for floppy disks making it an ideal program and data storage solution for industrial equipment and machine tools. The device is a simple plug in a thumb drive that allows easy transfer of files to the Floppy Connect. Users simply remove the existing drive and the FD Connect plugs directly into the ribbon and power cables of the old drive. It is compatibility with 720K or 1.44MB systems. For more information, contact our sales department at (877) 611-5825. Read more below. Replace your floppy disk on your CNC machine tool. We have a device called the Floppy Emulator. A lot of times, we still see the floppy discs out on the shop floor. As you well know, these are too hard to find, hard to maintain, and unreliable! So, we’ve come up with a solution to allow you to eliminate that floppy disc by using our Floppy Emulator. This device basically allows you to use a USB stick that you can plug into your PC, format it to 1.44 MB, plug it into this device, and deliver your NC program to your machine control. The advantage is that you no longer have to deal with that media and essentially is more reliable, but everybody has a USB stick available at their PC. We supply all the documentation and it’s very simple to connect. On the back of your machine, you typically will have a power cord and an IDE Cable you plug that in the exact same spot, then it’s up and running! Your machine control believes that it is still using a floppy disc, so procedure on the machine is exactly the same. This is why we prefer and recommend the solution to eliminate the floppy disc, it allows you to breathe life into your equipment, and continue to use your machine tools, but deliver a better method of managing your NC programs, rather than a floppy disc.